A community recital series in Aspen's historic West End. The Music in the West End 2019 season features both new collaborations and local, beloved favorites. Please join the musicians for a reception in Rowland-Davis Hall following each concert. Music in the West End is a concert series presented by Christ Episcopal Church for Aspen and the Roaring Fork Valley. 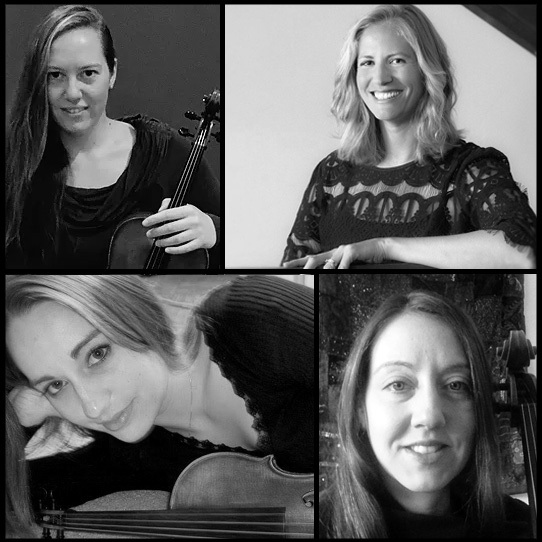 Professional musicians of varying genres present free, one hour concerts to the public. No tickets are sold for the concerts, but those who attend are invited to make a donation. Concert goers are invited to attend a reception following each event. Music in the West End is managed by Christ Episcopal Church Music Director Molly Noel. Molly is a much sought-after collaborative pianist in the Roaring Fork Valley. After earning her Masters of Music from Boston University she has gone on to perform with various institutes and ensembles including the New England Philharmonic and Concord Orchestras and on the stage of Boston's Symphony Hall with the Boston University Orchestra. As a staff accompanist with Boston Conservatory she coached vocalists, played for private voice studios and accompanied ensembles and numerous private recitals. Molly's performances have taken her around the United States and Europe. She has studied in Salzburg, Austria and was the winner of the 2002 Leopoldskron Concert Competition. She has been a staff accompanist for the Boston University Tanglewood Institute and the Heifetz International Music Institute. Prior to her music director post, she worked in the Aspen Music Festival and School's Student Services for five years. Yes, keep me informed of concerts and events via email! Are you human? Please enter the verification code above. Copyright © 2019 Christ Church Aspen. All Rights Reserved. Site by nikki B. | design technology consulting. 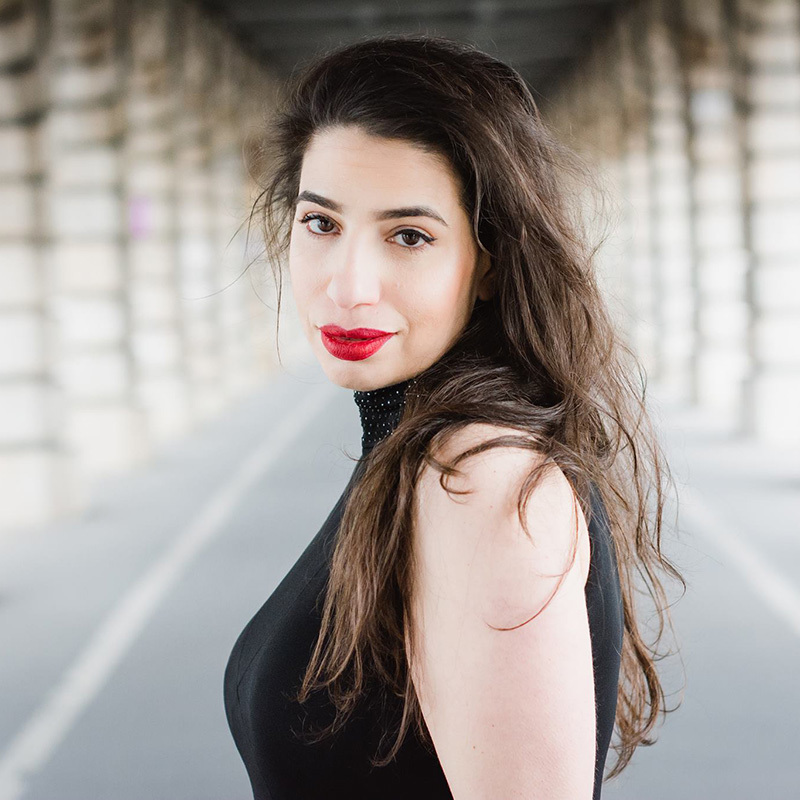 Born in Israel, trained in New York City and currently living in Paris, Naama Liany has performed at the Carnegie Hall and the Everson Museum of Art. She won the First Prize at the Buchman-Heiman Competition and has received scholarships from the Shlomit Ben Zvi Foundation and the Ronen Foundation for eight consecutive years. From her current home in Paris she participated in a number of festivals in Europe, including the New Year's Festival (Gstaad), the Clasicos En Alcala Clasicos Para Todos Festival (Madrid) and the De la Musique Avant Toute Chose Festival (Paris). As a young soloist she performed at the Lyrique en Mer Music Festival (Belle Ile en Mer, France). Later she sang Mozart's Mass in C minor in St. Germain En Laye. Naama was one of a hand-picked group of young singers at the Gstaad Vocal Academy (Menuhin Festival Gstaad) directed by Cecilia Bartoli and Silvana Bazzoni. She was coached by the recently deceased maestro Alberto Zedda. Currently, Liany works with legendary mezzo-soprano Victoria Cortez and Maestro Tamir Chasson. Schubert: Sonata in Bb Major D 960, 3rd mvt. 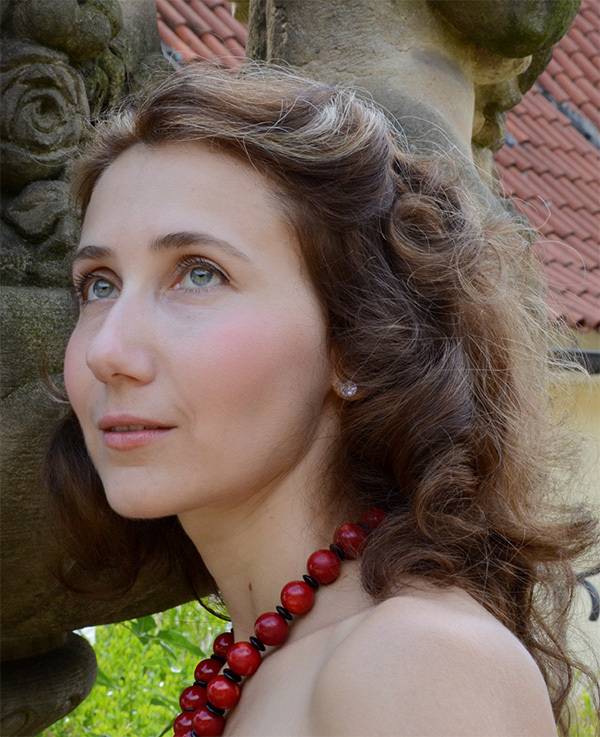 Internationally-recognized Czech pianist Karolina Syrovatkova has been called by the ABQ Review "a true poet of the piano." She is known for her innovative approach to performing in which she combines her pianistic and dramatic talents to create shows about great composers. She is the winner of several international competitions including the North London and the Sidney M. Wright Presidential Competition. Her vision as a musician is deeply rooted in both the pianistic lineage of European(L'Ecole Normale in Paris, Prague Conservatory) and American schools (University of Maryland: BM, University of Texas at Austin: MM and DMA) and in the well-established principles of the Alexander Technique (AmSAT Certified Teacher). In addition to an active performing and teaching career, Karolina's multifaceted musical vision has led her to launch classical music series both in the US and in Europe. She has been a champion of Czech music, particularly the music of her distant relative, Bedrich Smetana and of Leoš Janáček. Her latest CD of Janáček's complete piano music will be released in December 2018. Her experimentation with bridging the gap between classical music and its audiences has led her to create a new art form she calls a "drama concert." Her series titled Living With the Great Composers combines theater and a classical piano recital in an educational, easy-to-understand and easy-to-love format. She has written and channeled the personae of Fanny Mendelssohn, Clara Schumann, Olga Janáček, and Caroline von Esterházy. Her latest drama concert entitled "Vitka: the Lady in a Bow Tie" has been featured at the Kennedy Center in September of 2018. You can find her on Youtube or at www.pianistkarolina.com. 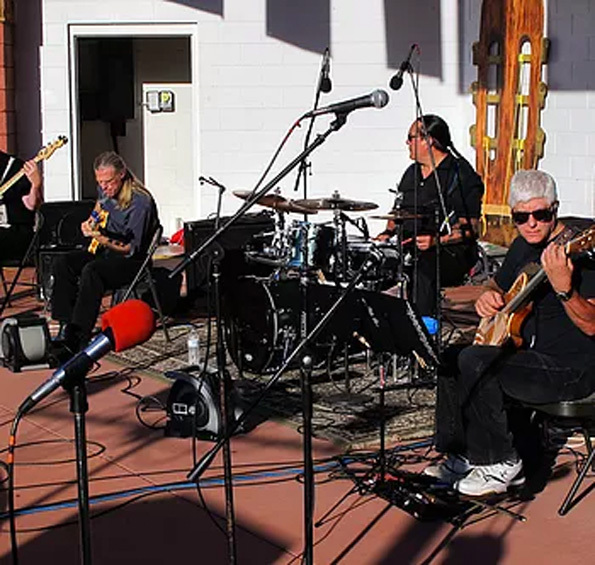 Go on a musical journey with a new musical collaboration, Valle Musico, consisting of guitarists Pat Winger and John Ramo, bassist Bruce Imig and guest vocalist Lee Martin McCorkle. 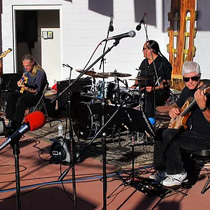 With a musical mission to bring a fusion and new interpretations of classical, jazz and worldbeat music to audiences, Valle Musico has a musical focus that explores the confluence of these genres in exciting and new musical ways. Valle Musico was inspired by John Ramo’s meeting the musical icon Paul Simon in his apartment in New York City when “Graceland’ was first released in 1987. His conversation with Paul Simon inspired John , especially when Paul Simon stated that music, for him, was essentially about guitars and percussion. This theme forms the basis of Valle Musico’s musical collaboration - an exploration of guitars and percussion, the improvisational and notated aspects of classical, jazz, worldbeat musical genres and how they blend, combine and fuse.